RuggedJet™3 mobile printers…Simplifying MobilityIntuitive … Connected…. 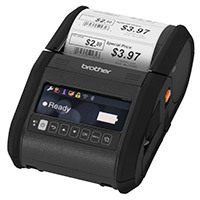 ReliableThe Brother RuggedJet™3 mobile printers with intuitive color display for easier user interaction deliver a label and receipt printing solution for businesses large or small. They are designed to deliver cost effective mobile printing solutions without sacrificing performance or versatility plus have a reassuring "bumper-to-bumper" Warranty*. The RuggedJet™3 is fast, tough, versatile with print speeds up to 5 ips, IP54 certification, 6 ft. drop tested, dual wireless radios in every model, multiple OS support – Android™, iOS®, Windows®Mobile and a "bumper-to-bumper" warranty* covering you against defects or damage for peace of mind. Brother RuggedJet™ printers are available in two models, RJ-3150 for labels and receipts and the RJ-3050 for receipts, to cover your label and receipt printing needs in almost any application. Furthermore, both models include Bluetooth® technology and Wi-Fi wireless interfaces, to support your printing needs in your building or out in the field. RuggedJet™3 mobile printers offer a competitive combination of value, versatility, reliability, innovation, ease of use and an outstanding guarantee. The RuggedJet™3 printers can be used in a wide range of receipt and label printing applications in retail, public safety, field service, route accounting, manufacturing and warehouse industries and more. 203 dpi resolution – Ensures compatibility with existing mobile applications. Wide range of connectivity options – USB, USB Host, Bluetooth, and WiFi (802.11 b/g/n). AirPrint™ Certification; - Enables printing directly from an iOS™ device without loading drivers. Printing support is built right into the operating system making printing easy.